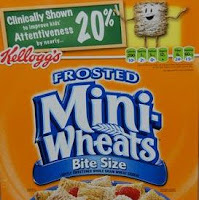 The FTC announced yesterday that it has settled a dispute with Kellogg's over an advertising campaign that falsely claimed that Frosted Mini-Wheats were "clinically shown to improve kids' attentiveness by nearly 20%." Kellogg's made the claims in a national advertising campaign, but the study it relied on found that children who ate the cereal averaged an increase of less than 11 percent in attentiveness compared to children who ate no breakfast at all. Only one in nine children showed an increase in attentiveness of 20% or more. The settlement agreement prohibits Kellogg's from making similar claims in the future about any breakfast food or snack food unless there is reliable evidence that supports the claims. Just like Kellogg's experience with Frosted Mini-Wheats, many consumer product companies that compete in mature markets are aggressive with advertising claims, which is often the principal means of product differentiation. In the consumer products industry, an aggressive advertising claim that lacks credible substantiation will typically be challenged by a competitor that risks losing market share because of the claim. A competitor can petition the FTC to investigate a company's claim (which is likely what happened in Kellogg's case), can file its own lawsuit against the company under the Lanham Act, or can challenge the claim within the National Advertising Division of the Council of Better Business Bureaus, an industry self regulating body that renders decisions on the legitimacy of advertising claims. Credible claims substantiation is important for any advertiser, particularly consumer products companies that compete in mature markets and face intense scrutiny of claims by competitors. While the FTC consent concerning Kellogg's Frosted Mini-Wheats claim will likely not materially affect the success of the brand, Kellogg's marketers probably did a disservice to the brand by employing the aggressive claim: the FTC enforcement action is embarrassing, the advertising campaign will have to be stopped in mid-stream (which will be confusing to consumers), and Kellogg's costs will increase as the organization eliminates the claim from its packaging.